Today we have launched a new debt tool on our website to help you see how well you are managing your finances. Diagnose your Debt is an easy to use calculator designed to ask you a series of simple yes and no questions about your lifestyle and spending. Once you have completed the questions our tool will diagnose how debt savvy you are. It is an eye opening tool that we urge everyone to use. You might think you are managing your money well and that your budget is working but the debt warning signs are not always obvious. Diagnose your debt aims to highlight any money issues before they become a problem – our questions centre around the most common debt warning signs so this tool will help you pinpoint how well you are managing your finances. If our tool highlights that you are struggling we will offer tips and advice to help you regain control of your debts – whether that’s an article showing you how to create a successful budget or whether that’s recommending you speak to a free debt adviser to talk you through what debt solutions might be available. Many people struggle alone with their debts. In a recent survey we conducted, 91% of people say they feel stressed about their finances. We want to spread the word and warn people about the early signs of debt. Recognising issues early mean problems can be solved more quickly. 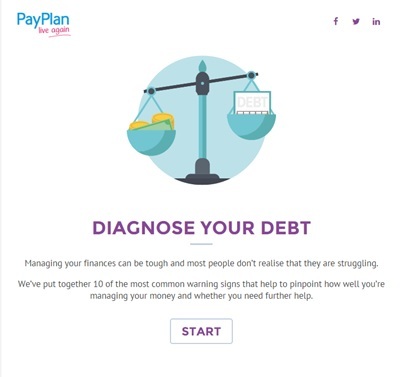 If you are struggling with debts or need any advice, PayPlan are here to help. i am a pensioner and want to know why, after 7 years of paying off my debt faithfully with no hassle from creditors, i need to change to a iva and pay payplan fees every month? Generally an IVA is suggested if it is felt to be the best outcome for a client. Clients can be in debt management plan for many years and there is no guarantee that interest and charges will be frozen. An IVA guarantees an end term and although there are fees – for the insolvency practitioner’s expertise in writing off debt – as the disposable income is the same no client should be losing anything. Basically the creditors get less and as they have to agree on approving it they are fully aware of this but think that it is better to bring things to a closure. In a debt management plan – run by Payplan or StepChange – then the creditors pay what is called fair share on the amount of money paid to them which is how these plans are funded. However, it is your decision and you do not have to do an IVA – you can continue to pay the money until the debt is cleared. However, the Financial Conduct Authority is no fan of long term DMPs as they do not believe it is always best for the customer which is why all plans are regularly reviewed to see if there is a better option. The debt may well have been passed to a debt collector. If you last made a payment to this debt in April 2011 (and it was not in joint names with someone else who continued to pay), you have not acknowledged it in writing and the creditor or his agent has not gone for a county court judgment then the debt may be statute barred. This does not mean you do not still owe the money but that they cannot go to the courts to get it back. If they have already been to court then the debt is never statute barred in England and Wales although to enforce it after six years the creditor has to go back to court to explain why he wants to enforce it now and did not do so before. Otherwise it became statute barred in May 2017. They can chase you but you can also tell them it is statute barred and unless they can prove it is not, they should stop contacting you.